Before I go out I wanted to briefly mention a recent paper by Patrick Brown and Ken Caldeira called [g]reater future global warming inferred from Earth’s recent energy budget. Patrick Brown already has a nice blog post about this with a couple of really informative videos. I encourage you to read Patrick’s post and watch the videos. The basic idea, though, was to try and constrain the models on the basis of how well they match recent observations. In particular, how well do they simulate top-of-the-atmosphere energy balance (reflected solar radiation, outgoing infrared radiation, and net energy balance). As Patrick’s post mentions, these are amongst the most fundamental aspects of global warming. The key result is shown in the figure below. When you constrain the models on the basis of how well the match these observational constraints (pink band, red line), they project more warming than the unconstrained model results suggest (grey band, dashed line), and the range is slightly reduced. For example, if we follow and RCP4.5 concentration pathway, this would suggest we would warm about as much as suggested by the original RCP6 results. Also, the mean ECS value from the constrained models is 3.7oC, with a likely range from 3oC to 4.2oC (right-hand panel below). 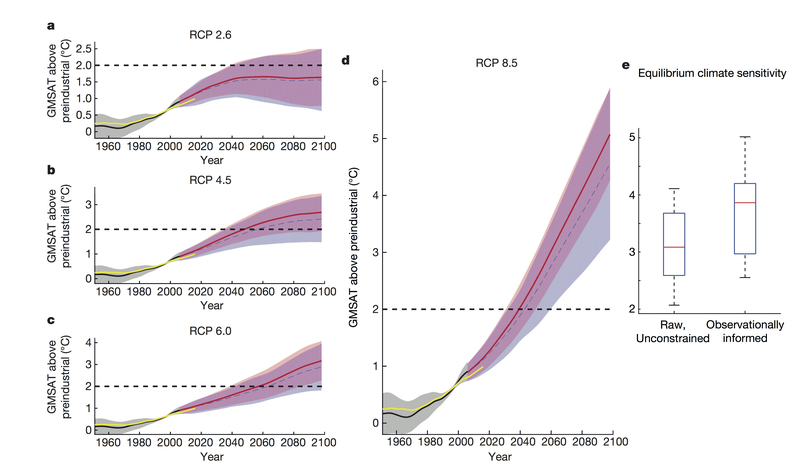 achieving any given global temperature stabilization target will require steeper greenhouse gas emissions reductions than previously calculated. Patrick Brown’s blog post about his recent paper. Steve Forden made a good point on Twitter. If you consider the left-hand panel of the figure, the difference between the constrained model results and the original results is not particularly significant for the lower emission pathway. Therefore what I quote at the end of the post is probably not really true for a temperature target of around 2oC (i.e., the result in this paper doesn’t really change what emission pathway we would need to follow to achieve such a target). This entry was posted in Climate change, Climate sensitivity, Global warming, Research, Science and tagged Climate models, Equilibrium Climate Sensitivity, Ken Caldeira, Patrick Brown, Projected warming, RCP4.5, RCP6. Bookmark the permalink. 71 Responses to Greater future global warming? Mal, Just to a ceileidh. What does the yellow line represent? Yes, the yellow line is Berkeley Earth. predicting, I assume the ECS from your work would be in the 3.5-4C range? The ECS he uses [I thought we just had a big discussion where you guys said you cannot work out ECS?? practically like this but….] is on average 3.7 instead of the Climate models 3.0. Plug this into the graphs and you get a 27% higher rate of increase. Not able to afford the paid look so what is studiously not mentioned here is what the “recent” in Earth’s recent observational energy budget refers to. Please do not tell me that they picked the 3 most recent El Nino years and then worked out an energy budget and ECS on those 3 atypically hot years. Or just the last 5 years. Please tell me it refers to the budget worked out from 2000 at least. In climate, follow the energy. The modulz that are good at replicating the current TOA energy flow predict it will be hotter, sooner, than the modulz that are bad. I suspect the same might be true if you follow the money and look at economic modulz of cash flow. Almost made me think I understood the PLS method! As far as I know there are no direct observations of the energy imbalance at TOA. CERES published analysis states that it was adjusted to agree with models – imbalance of 0.6 W/m2 . OHC is not a direct measurement of energy imbalance either. I don’t think it was adjusted to agree with the models. As I understand it, they use the OHC measurements to calibrate the CERES observations. I know it’s not a direct measurement (not even quite sure what that would be) but it’s a pretty good indicator. If you look here: https://ceres.larc.nasa.gov/science_information.php?page=EBAFbalance you will see that instrument uncertainty is larger than the effect (TOA imbalance) to be measured. In other words CERES TOA value is adjusted so as to agree with OHC. It may be true, but it is a circular argument without any direct experimental evidence. Except you claimed adjusted to agree with the models, which is not true. It’s also not, AFAIA, adjusted to simply agree with the OHC. The OHC is used to calibrate the CERES observations. However, what they used was more than simply the energy imbalance. They also used the refelected sunlight and the outgoing longwavelength flux. OK so we agree, however you want to describe it. There is so far no ‘independent’ measurement of a radiative energy imbalance between incoming solar energy and outgoing IR energy at the TOA. If I agree with you, I will tell you I agree with you. Perhaps you could give an example of what you would accept as an independent ‘measurement’. Given that it is an imbalance presumably it requires, (at least) two global measurements to derive the difference. A) There is no TOA imbalance that we can infer from observations. B) The observations we have are incapable of providing a TOA imbalance estimate. C)The error range of the observations we have give a TOA imbalance range that exceeds the modulz incoming solar and outgoing IR => TOA imbalance spread. Presumably not only Lewis but Brown is working out ECS. A higher ECS, as in this case, gives a greater temperature rise for a doubling of CO2. The only difference being one uses a long term study of temps and the other a short term study of temps to determine the ECS. I imagine this study could be done for a number of recent observational ranges. If one was to choose the 5 years from 2007 to 2012 for comparison the ECS may well have been below 2.0. Presuming the paper was done on the last 5 years of observation which is a very uneducated guess on my part. Do we know which time frame the recent observations were done in? You could do the estimate using a short time interval, but this is one reason to be cautious of observationally-based estimates. The ECS is the equilibrium temperature change (considering fast feedbacks only) after a doubling of atmospheric CO2. It takes a long time to reach equilibrium. Therefore, if you only consider short time periods, you may not capture all the processes involved and the estimate may be less reliable than if you consider a much longer time interval (or that you would get from model estimates that are able to consider the full time interval). The answer is C) The error range of the observations we have give a TOA imbalance range indistinguishable from zero. The measured heat content of the top 700m of the world’s oceans have apparently absorbed ~ 1.3×10**23 Joules of energy. The heat content of the oceans is equal to the heat capacity of salt water times the change in temperature integrated over the entire mass of oceans. The total area covered by oceans in Earth is about 3.6×10**14 m2, and the heat capacity of water is 4×10**3 Jkg-1K-1. So this increase in heat content corresponds to a net temperature rise in the top 700m of about 0.15C. Now lets see if the integrated TOA imbalance integrated over the oceans can explain this rise. Assuming constant net TOA forcing of 0.6 W/m2 since 1960, the total energy imbalance since then = 0.6*3.6*10**14*(no.of secs since 1960) = 3.4*10**23 (+- 2.3*10**23) joules. That is roughly 2.5 times greater the total ocean heat content increase (1.3*10**23 joules) but is probably just about compatible within errors. So it is this statement I am questioning. The basic idea, though, was to try and constrain the models on the basis of how well they match recent observations. In particular, how well do they simulate top-of-the-atmosphere energy balance (reflected solar radiation, outgoing infrared radiation, and net energy balance). The 0.6 W/M2 value for TOA imbalance comes from models not direct observation alone. Can anyone prove me wrong? The OHC comes from measurements. The ocean has also the largest – by far – heat content in the system. If the OHC is not a measurement that allows one to reliably estimate the TOA energy imbalance, can you explain where else the energy is going, or coming, from? Actually, Clive still hasn’t answered izen’s question. I’d be interested in an answer. You are observing a likely effect (OHC) but not the cause (GHE). If one could measure the energy imbalance directly then we could calculate ECS directly. It would also prove unambiguously that an enhanced greenhouse effect was the driver of recent climate change. Otherwise everything always relies on models and this is the main reason why the spread of ECS estimates has not reduced in nearly 30 years. You haven’t answered my question. The ocean has the greatest – by far – heat capacity in our climate system. We also have measurement for other parts of the system too. If the increase in OHC is not a reliable indicator of a top-of-the-atmosphere energy imbalance, where is this energy coming from? The answer to Izen’s question. It would also be interesting to see if there are seasonal variations in IR flux for example NH summers versus SH summers etc. The data period used in the paper is 2001-2015, basically defined by availability of complete annual CERES data at the time they were conducting the study. On TOA flux measurement, as I understand things the global annual average absolute net flux from CERES is very uncertain in relation to any imbalance. Proportionally absolute flux errors are arguably fairly small, only around 1-2%, but with the global average TOA imbalance we’re trying to find something smaller than that. However, the month-to-month and year-to-year changes are considered to be highly accurate, so what’s needed is some kind of ground-truthing to define a uniform offset for the data. The published CERES-EBAF release uses Argo OHC data to do that. I’m not sure this is really relevant to the study in question though since, based on some of the figures, they seem to be utilising short-term variations in spatial CERES TOA data rather than longer term absolute global averages. They found correlations between short-term flux variations and long-term feedbacks (and therefore climate sensitivity) in CMIP models, and then determined an equivalent short-term flux variation observational figure from CERES TOA data. They then infer long-term feedback strength by applying the observed figure to the correlation found in models. You would expect outgoing IR flux to decrease? That’s not what climate scientists expect. It would have been for the 20th Century but if you look at the CMIP5 mean for upwelling TOA longwave from the present over the next century it’s an upward trend. The Planck response wins out over the greenhouse effect. Instead what’s expected is a decrease in outgoing shortwave due to reduced surface albedo from snow and ice loss, and in some cases reduced cloud albedo. It’s also bolstered by aerosol forcing reductions. However, the month-to-month and year-to-year changes are considered to be highly accurate, so what’s needed is some kind of ground-truthing to define a uniform offset for the data. The published CERES-EBAF release uses Argo OHC data to do that. Thanks, that’s my understanding too. If CO2 is always increasing then outgoing IR is increasingly being curtailed, which leads to a Planck response to warm the surface. However it never quite manages to balance outgoing IR with the fixed incoming solar mainly due to the oceans – hence the energy imbalance. So yes outgoing IR does decrease with increasing CO2. If CO2 stops increasing the energy balance will soon disappear. So If CO2 were to stabilise at say 600ppm then the energy imbalance at the TOA would fall to zero and we would know ECS exactly. So yes outgoing IR does decrease with increasing CO2. If CO2 stops increasing the energy balance will soon disappear. You haven’t actually addressed what Paul suggested. He suggested that, in fact, outgoing IR actually increases under future scenarios and that the energy imbalance is largely due to the reduced out-going shortwavelength flux due to reductions in albedo. Do you have any evidence to the contrary? Yes, but this would take a long time. There are reasons why we may not want to actually carry out this experiment. To continue a little, I don’t know if Paul is correct, or not, but as I understand it, we’re unlikely to build up a large planetary energy imbalance. If we continue increasing emissions then I think we expect the surface to warm so as to keep it around 1Wm-2. Hence, I don’t think we’d expect to see much in the way of a reduction in outgoing longwavelength and – as Paul suggest – if the albedo does reduce, we may expect it to even increase while still sustaining a planetary energy imbalance. In a nutshell, isn’t this Donohue? AR5 estimates an average of 0.4 W/m2 for 1971-2010 I understand. It seems unlikely increased positive forcings, or reduced negative forcings (human and volcanic) have changed the average that much in the last 7 years. Is that before or after half of Greenland and the WAIS melts out ? Are the modulz that best replicated recent Sol-in/IR-out also the ones that best replicate the recent GMST ‘slowdown’ (2001-1013?) therefore the best modulz of the paws give the worst future outcomes ? In a steady state situation energy will always balance. If CO2 increases IR will decrease and the surface then warms to restore energy balance. When CO2 stops increasing the planet reaches a new equilibrium. If ice also melts then albedo reduces and the sun warms the surface a bit more until energy equilibrium is restored. Likewise if cloud cover increases albedo increases cooling the surface until equilibrium is again restored. We always see a reduction in outgoing IR when there is a negative energy imbalance. Increasing Albedo reduces the net incoming solar radiation. The equilibrium outgoing and incoming net flux will remain constant so long as the earth’s orbit remains stable, as does TSI. We always see a reduction in outgoing IR when there is a negative energy imbalance. Increasing Albedo reduces the net incoming solar radiation. No, I think this is not correct. A negative energy imbalance could also be associated with a reduction in albedo. Also, as I said above, if we continue to emit GHGs into the atmosphere I think we expect the surface to warm in such a way that we don’t expect to ever produce a very big planetary energy imbalance. Hence, I don’t think we necessarily expect a big reduction in outgoing longwavelength radiation – if the planetary energy imbalance stays at around 1Wm-2 then we wouldn’t expect to see a reduction in outgoing longwavelength under global warming. I’m not sure about this, though, so if someone knows better, please elaborate. In response to increasing concentrations of atmospheric CO2, high- end general circulation models (GCMs) simulate an accumulation of energy at the top of the atmosphere not through a reduction in outgoing longwave radiation (OLR)—as one might expect from greenhouse gas forcing—but through an enhancement of net absorbed solar radiation (ASR). A simple linear radiative feedback framework is used to explain this counterintuitive behavior. It is found that the timescale over which OLR returns to its initial value after a CO2 perturbation depends sensitively on the magnitude of shortwave (SW) feedbacks. If SW feedbacks are sufficiently posi- tive, OLR recovers within merely several decades, and any subse- quent global energy accumulation is because of enhanced ASR only. In the GCM mean, this OLR recovery timescale is only 20 y because of robust SW water vapor and surface albedo feedbacks. However, a large spread in the net SW feedback across models (because of clouds) produces a range of OLR responses; in those few models with a weak SW feedback, OLR takes centuries to recover, and energy accumulation is dominated by reduced OLR. Observational constraints of radiative feedbacks—from satellite radiation and surface temperature data—suggest an OLR recovery timescale of decades or less, consistent with the majority of GCMs. Altogether, these results suggest that, although greenhouse gas forcing predominantly acts to reduce OLR, the resulting global warming is likely caused by enhanced ASR. Great, thanks. This seems to support what Paul suggested. Altogether, these results suggest that, although greenhouse gas forcing predominantly acts to reduce OLR, the resulting global warming is likely caused by enhanced ASR. OK yes that’s true. If the net absorbed solar radiation increases then IR begins to increase. The GHE is different because it initially reduces IR cooling. Okay, but the point is what would observations would we need to make to assess global warming. It now seems clear that outgoing longwavelength and TSI would not necessarily be sufficient. I can only show what CMIP5 models actually produce for upwelling TOA longwave flux.While historically outgoing longwave decreases, In all scenarios outgoing longwave flux increases from 2010 to the end of the century. By the end of the century, if not sooner, outgoing longwave flux is greater than it was at the beginning of the run. There are differences in absolute numbers because a smaller sample of modelling groups submitted simulations using the rcp2.6 and rcp6 scenarios. There is presumably some spread in behaviour across the ensemble but there certainly is no clear expectation that outgoing longwave would reduce in the future. Meanwhile, here is the time-evolving outgoing shortwave flux in CMIP5 models. The way I would think about it is that the very strong negative Planck feedback is solely a longwave response, whereas other feedbacks are net positive in both longwave and shortwave (the latter due to ice albedo and possible clouds). Without an equivalent shortwave Planck response outgoing shortwave clearly can only keep decreasing as temperatures increase, which causes more temperature rise and further strengthens the Planck response. Great, thanks. I have to admit that the reduction in outgoing SW flux is greater than I was expecting. One seldom goes wrong paying careful attention to the points Paul S. makes. Okay, I’ve never gone doing that, but I’m open to there being a first time. I’ve always wanted to go back and get out the Graeme Stephens paper about albedo and look at both of them, Donohue and Stephens, at the same time. I don’t why, but they are both intriguing insights into how the system works. If you believe those CMIP5 graphs for TOA fluxes outgoing IR increases by 1.5 W/m2 under RPC 8.5 after 2010, while outgoing SW decreases by 3 W/m2 ! That means the net energy balance increases to 1.5MW/m2 by 2100 . Did you really mean MW/m^2? Actually no, but then again I have had a couple beers. Perhaps we have inadvertently found the perfect renewable energy source. We just need to collect all that excess surface energy to generate electricity. Cover Greenland with solar cells before the ice melts! Why? The current imbalance seems to be about 1 W/m2 where it was probably just above zero a hundred years ago. If forcing keeps increasing as it has, I’m not sure how it would be possible not to hit at least 1.5W/m2 by end of century. The exact figures put it closer to 2.5W/m2 by the way. GMST is fundamentally a result of a global energy imbalance at the top of the atmosphere and changes related to OHC. If we get the OHC right, we’ll get the GMST right. Reflected solar radiation, outgoing infrared radiation, and the net energy balance look like a TOA exit accuracy test. If we get the TOA exit right, we’ll get the GMST right. At this point we’ve bracketed the atmosphere with the oceans below and the TOA on top. The TOA exit rate seems to rely materially but not exclusively on OHC changes. A warmer GMST in the future will increase the atmosphere’s differential across the TOA and the OHC boundary. So we are trying to determine the exchange rates at the top and the bottom of the atmosphere in the past, present and future. I am surprised that it gets as large as 2.5W/m^2, but I guess that is under a high emission pathway in which the external forcing is increasing quite rapidly. What this really says is that the sun will dominate surface warming in the future – not CO2. So if those models are right then outgoing IR is already increasing in 2018 as more absorbed sunlight warms the surface due to a reducing albedo. In fact it implies that it is almost too late to stop global warming because Ice melt will continue for 100 years even if we curbed all CO2 emissions. However there really are a lot of assumptions about an ever reducing albedo being made by such models, especially clouds. I have always had a problem with the RPC scenarios because they assume the forcing in 2100 is a certain value, whereas each model should really derive the forcing differently. What this really says is that the sun will dominate surface warming in the future – not CO2. Ignoring geothermal, the Sun is the source of all the energy. That the planetary energy imbalance is mostly due to reduced outgoing SW, rather than reduced outgoing LW, does not mean that the warming is due to the Sun. It is still mostly due to our emissions. In fact it implies that it is almost too late to stop global warming because Ice melt will continue for 100 years even if we curbed all CO2 emissions. No, it does not mean this. The ice melt is happening because of global warming. Global warming is mostly a consequence of us emitting GHGs into the atmosphere. There is no reason to think that the ice melt would continue even if we halted all emissions (okay, there may be some unrealised albedo feedback, but not as much as suggested by Paul’s graphs). In a sense you’re suggesting that our climate is much more sensitive than current evidence suggests. I have always had a problem with the RPC scenarios because they assume the forcing in 2100 is a certain value, whereas each model should really derive the forcing differently. I have no idea what your problem is (what do you mean by “derive the forcing differently”?). RCPs are simply forcing scenarios which allow us to try and understand what will happen under different future pathways. Just to follow up on my previous comment, the albedo changes are a feedback, not a forcing. Global warming is not a binary proposition. The greater the temperature rise, the greater the impact. And impacts are highly non – linear, so for every incremental bit of committed warning, reducing emissions actually becomes more, not less important. It will never be either “too late ” nor “too soon” to take action. I think it more says that a simplistic model which doesn’t take into account feedbacks is useless for attributing causation through TOA flux observations. Given that the Sun doesn’t change in these scenarios attributing warming to the Sun would be a strange interpretation. It’s the surface and atmosphere that are causing the shortwave flux change, in response to surface warming driven by anthropogenic GHG increases. Can’t see how you’re getting that from the graphs? The shortwave flux changes are clearly highly dependent on scenario and the decline is pretty much halted by mid-century in the strong mitigation rcp2.6 scenario. If you’re talking about long-term ice sheet responses, then yeah, we should see further warming from that, hence Earth System Sensitivity > ECS, but the amount will very likely depend on emissions scenario. 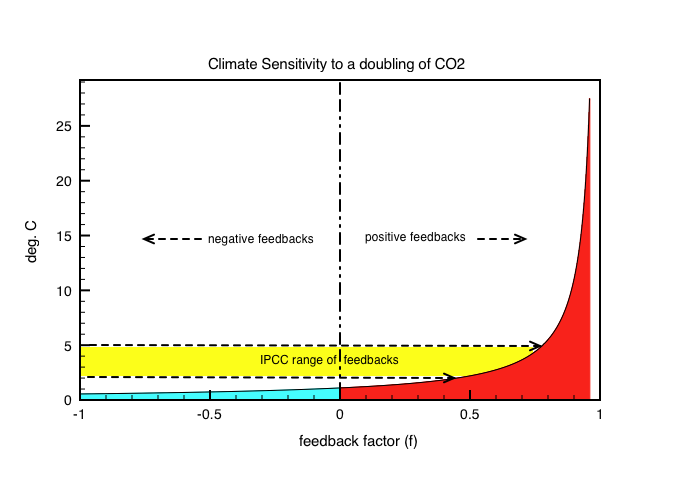 If model feedbacks dominate over AGW CO2 driver then something IMHO is clearly wrong. I think you’re ignoring the negative Planck response in your something IMHO is clearly wrong. Including the Planck response, the overall feedback is negative. Actually, Clive, I think in your figure is relative to the Planck response, not relative to the change in external forcing (what you’ve called the AGW CO2 driver). Nope . It is a simple feedback factor. Suppose the net feedback gain is f so that a temperature rise DT gets enhanced by (1+f)DT, but now we have a second amplification f(fDT) or f^2DT to add on and so on. The climate system would soon run out of control if the feedback gain approaches 1 as follows. Yes, I know what it is. I’m pretty sure it is relative to the Planck response. When we have what is often referred to as the non-feedback response of 1.2oC. When we have runaway – the net non-Planck feedback response (positive) exceeds the Planck response (negative). I should make clear that is almost certainly less than 1 and nothing Paul has presented contradicts this. I’m not really sure what you mean by “feedbacks dominate” here. It’s clear from the results that the effect is highly dependent on forcing and there’s no runaway feedback effect. This is mostly just a matter of a changing balance of OSR and OLR in the net TOA flux. If you think about an equilibrium case after 2xCO2 (longwave) forcing, the reduction in OLR due to the forcing+longwave feedbacks will be matched by the increase in OLR due to temperature increase via Planck response. However, if there is any net positive shortwave feedback, meaning a reduction in OSR, that shortwave gap remains open indefinitely. To plug the gap in total radiation requires more temperature increase and longwave Planck response. So at your end-point equilibrium, if there is net positive shortwave feedback there must be greater OLR (and less OSR) than at your start-point equilibrium. How that works out transiently over a given stretch of time is fairly complex, particularly when factoring in aerosol shortwave forcing, and dependent on magnitudes of various factors. First considering only longwave again, while the forcing is increasing the Planck response will always lag behind and OLR will decrease. If you factor in shortwave though, a positive feedback will increase the Planck response, further pushing it towards equalising, and even potentially overtaking, the forced OLR reduction. Thought I’d look at the effect broken down by latitude band. In the Arctic and Antarctic there are very large reductions in OSR, must be mostly due to sea ice loss and other snow & ice albedo feedbacks. The NH mid-latitudes and sub-polar band appears to produce the largest contribution to the global effect, with snow cover change a big factor and presumably some influence from atmospheric feedbacks. The Tropics showed a smaller effect, which was expected due to lack of snow and ice, but still considerable. I thought it would mostly be due to a positive shortwave cloud feedback reducing atmospheric reflection so looked at downwelling shortwave at the surface, but was surprised to find an even larger reduction (about 2x) than for the OSR (so, despite more shortwave being absorbed by the Earth overall, there was large reduction in shortwave absorption at the surface). That indicates the effect in the Tropics is actually primarily due to increased atmospheric absorption of shortwave. Reading around it seems to be mostly due to water vapour shortwave absorption, and not clouds after all. In fact, the Donohoe et al. abstract quoted by JCH says as much, so it might have saved me some time if I’d read that properly. The water vapour influence wasn’t something I’d considered previously. Maybe that helps explain the size of the shortwave effect being greater than you thought, ATTP? Maybe that helps explain the size of the shortwave effect being greater than you thought, ATTP? Thanks Paul, that helps explain the changes in expected LW & SW responses quite a bit better. The essential problem in the paper under discussion is that it rests on the assumption that models that do best on representing short term fluctuations in the TOA energy balance (this inference subject to all the usual caveats on the actual TOA measurments and the way they’ve been adjusted) also do best on the feedbacks that determine ECS. This is rather dubious, as the factors that control short term fluctuations are spatially inhomogeneous things that affect clouds and water vapor through the circulation — stuff like ENSO or other short term variability. You get very different cloud and water vapor responses if you do things like warm the whole tropics uniformly. It’s an indication, but not something one should bet the shop on. In my paper with Ian Williams in GRL, on lack of evidence for strongly stabilizing cloud feedback, we made use of similar fluctuations, but were more cautious in our inference. This paper is a useful addition to the ECS canon, and is a variant on something many earlier papers do (i.e. look at the ECS in the ensemble of models subsetted to do best on X metric). All have the same caveat. It’s an overhyped result, and decidedly not a game changer. I’m already terrified by what happens under RCP8.5, so what, I’m now supposed to be around 15% more terrified? (Even assuming the inference based on short term fluctuation is correct). Thanks, I did wonder a bit about this. Could have guessed the author of that. To SM’s “not so fast” there is now this not so fast.